Drew Estate is poised to release Undercrown Shade, a new line based on the Undercrown blend featuring a No. 1 grade shade-grown Connecticut wrapper. More than just a wrapper swap, this ‘Crown was a three-year process working from the ground up using the finest blend of well-aged, long leaf tobaccos from our vast holdings in Estelí, Nicaragua. Finished with a No. 1 golden shade wrapper, the most sought-after leaf in the world, Undercrown Shade is a naturally sweet, earthy smoke with satisfying body for any time of day. References to “the most sought-after leaf in the world” and “shade” imply the blend uses a Connecticut-grown wrapper leaf, as opposed to an Ecuadorian-grown Connecticut wrapper, which Drew Estate uses on Herrera Estelí. Ecuadorian wrapper isn’t usually grown under shade netting because of the natural cloud cover that produces a similar leaf without it. Also listed in the Tobacco Retailers Almanac is a previously unannounced La Palina Red Label. The line will comes in four sizes: Gordo (6 x 60), Toro (6 x 50), Robusto (5 x 52), and Petit Lancero (6 x 40). All are listed as shipping in boxes of 20. Although no other details are printed, a recent posting announcing the selections for Cigar Dave’s cigar of the month club reveal more details about the Dominican-made blend, which features a Ecuadorian Habano wrapper, Ecuadorian binder, and Nicaraguan and Dominican filler. 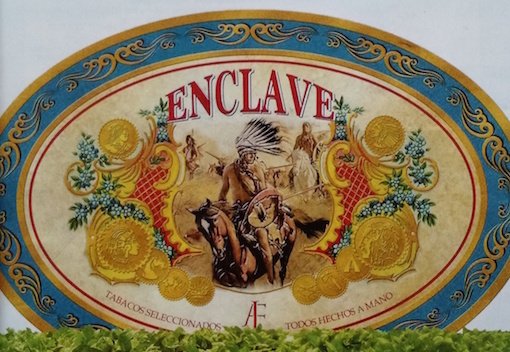 Although no other details are revealed, we do have artwork (above) to share for the upcoming Enclave cigar by A.J. Fernendez. The ad appears in the Tobacco Retailer’s Almanac. A February article in the publication BayouLife mentioned the project, though the blend was still being tweaked at the time. More details, presumably, will be unveiled between now and the start of the IPCPR Trade Show. Of this process similarly to the original Undercrown then I’m really looking forward to this. Sounds like a reintroduction of the Chateau Real which is a favorite of mine. Looking forward to this new cigar. The band will be white and gold as opposed to the blue and gold on the San Andre UC.